For some time, locomotives of the Union Pacific Railroad (UP) had struggled to climb the Wasatch mountains between Ogden, Utah and Green River, Wyoming. This 176-mile (283-km) stretch of track started out at 4,300 ft (1,310 m) above sea level in Ogden, climbed the Wasatch Range to 7,300 ft (2,225 m) at the Aspen Tunnel, and then dropped to 6,100 ft (1,859 m) at Green River. Occasionally, up to three helper engines were used to assist heavily loaded trains over the Wasatch mountains. In 1940, UP was enjoying a period of expansion, and its president, William Jeffers, was interested in a new locomotive that could conquer the Wasatch Range pulling 3,600 tons (3,266 t) unassisted. At the same time, World War II was on the horizon, and the United Sates had begun to increase its production of war material. This put even more traffic on the heavily-traveled Oden-Green River route. Headed by Otto Jabelmann, UP’s Department of Research and Mechanical Standards (DoRMS) in Omaha, Nebraska calculated that 135,000 lbf (600.5 kN) of tractive effort was needed for the engine to achieve its design goal. 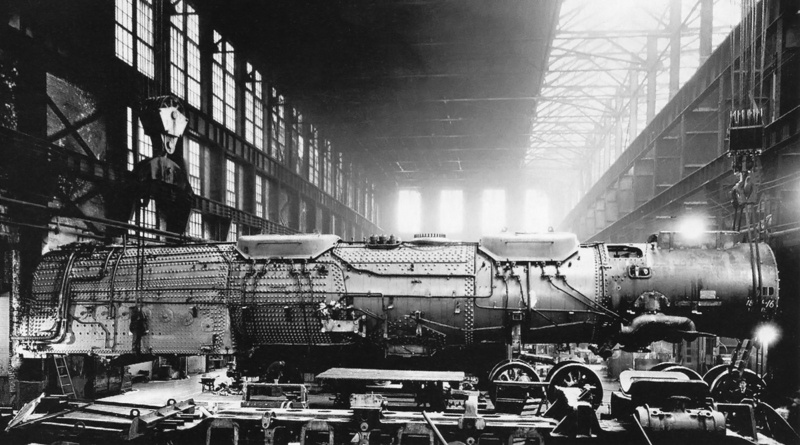 DoRMS quickly designed the new, massive locomotive and worked closely with the American Locomotive Company (ALCO), the company that agreed to build the engine. 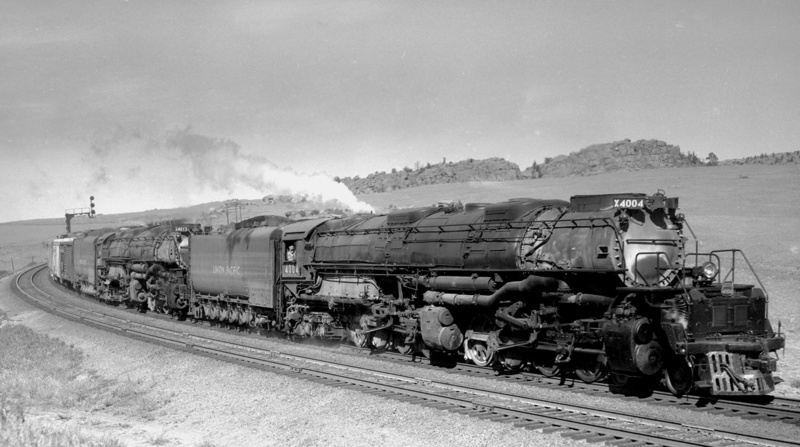 The engines were assigned numbers in the 4000-class, and there were plans to name the new series “Wasatch.” However, a worker wrote “Big Boy” in chalk on the front of the first engine while it was being built, and the name stuck. With its tender, the Big Boy was one of the largest and heaviest steam locomotives ever built. 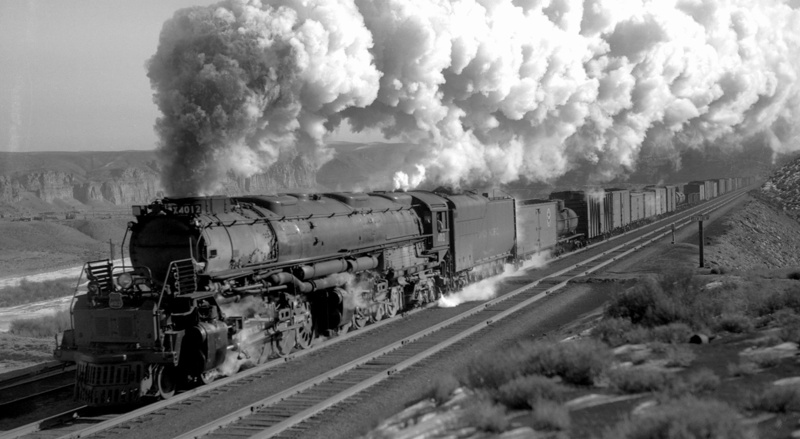 The Big Boy’s design was based closely on the UP’s 4-6-6-4 Challenger that went into service in 1936. However, the Big Boy was larger and heavier than the Challenger and necessitated that UP make many changes to the track between Ogden and Green River. Heavier rail was laid in many places, and curves were realigned and adjusted to maintain a constant curvature. At stations, larger turntables were installed to accommodate the Big Boy’s length. The Big Boy was essentially the largest thing that could normally operate on an existing standard gauge railroad. The Big Boy utilized a 4-8-8-4 wheel arrangement and was the only locomotive to do so. At the front of the engine was a four-wheel leading truck that had 36 in (.91 m) wheels. This was followed by eight 68 in (1.73 m) drive wheels, with a single piston driving a set of four wheels on each side of the engine. Another set of eight drive wheels followed that were identical to the first. Finally, under the cab was a four-wheel trailing truck with 42 in (1.07 m) wheels. The leading truck and first eight drive wheels were attached to a separate frame than the second set of drive wheels and trailing truck. Between the two sets of drive wheels was a tongue and groove pivot point that allowed the front frame to articulate independently of the rear frame. Mounted to the rear frame was the boiler, firebox, and cab. The articulated locomotive was pioneered by Swiss engineer Anatole Mallet and could handle tighter curves than a standard rigid locomotive. In the case of a long locomotive like the Big Boy, articulation allowed the engine to operate on tracks with curves as sharp as 20 degrees. ALCO built the Big Boys in Schenectady, New York, and two versions of the engine were made. 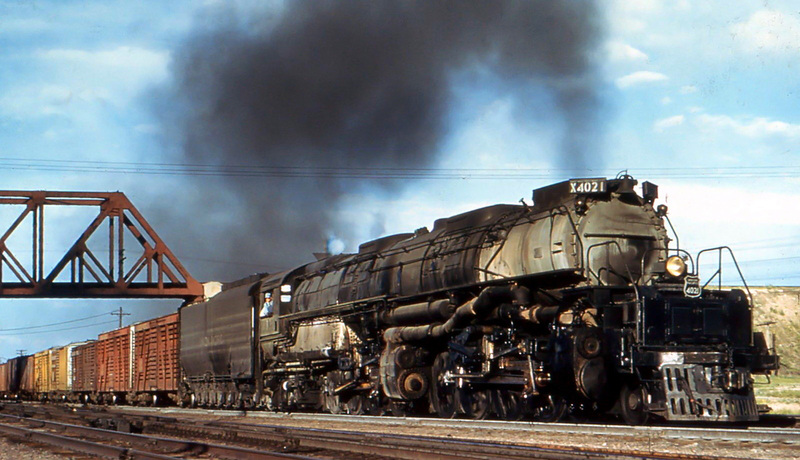 Starting in 1941, 20 of the 4-8-8-4-1 class engines were made and numbered 4000–4019. 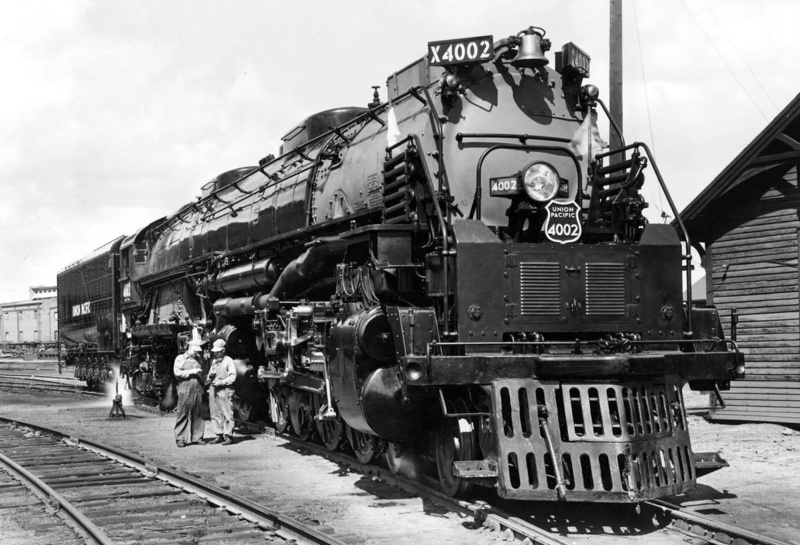 In 1944, five of the 4-8-8-4-2 class engines were made and numbered 4020–4024. The difference between the two versions was mainly a different superheater that necessitated changes to the tubing arrangement in the boiler and increased water storage capacity in the tender. These changes were made for maintenance reasons and also due to material shortages during World War II. The first engine, 4000, was delivered to UP in Omaha on 5 September 1941. All Big Boys were 132 ft 10 in (40.5 m) long and made up of an 85 ft 9.5 in (26.2 m) long engine and a 47 ft .5 in (14.3 m) long tender that carried the locomotive’s coal and water. The locomotive was 16 ft 2.5 in (4.9 m) tall, and its whistle was mounted horizontally so as to not increase the engine’s height. Various ladders and handholds were recessed into the engine and tender to keep the locomotive’s width at a maximum of 11 ft 6 in (3.5 m). The loaded weight of the -1 class was 762,000 lb (345,638 kg) for the engine and 427,500 lb (193,911 kg) for the tender, which gave a total weight of 1,189,500 lb (539,549 kg). The -2 class was heavier at 772,250 lb (350,276 kg) for the engine, 436,500 lb (197,993 kg) for the tender, and a total weight of 1,208,750 lb (548,280 kg). Each set of eight driving wheels supported 540,000 lb (244,940 kg) on the -1 class and 545,200 lb (247,299 kg) on the -2 class. The maximum weight permitted on each of the engine’s 12 axles was 67,800 lb (30,754 kg). The centipede-style tender was supported by 14 wheels, each 42 in (1.07 m) tall. The first four wheels made up the leading truck, and the 10 trailing wheels were mounted directly to the tender. The tender originally carried 56,000 lb (25,401 kg) of coal in a front compartment. In the late 1940s, 10 in (254 mm) tall steel sideboards were added to the top of the coal compartment. The sideboards enabled an additional 8,000 lb (3,629 kg) of coal to be loaded, increasing the tender’s capacity to 64,000 lb (29,030 kg). A rear compartment held 24,000 gallons (90,850 L) of water for the -1 class and 25,000 gallons (94,635 L) of water for the -2 class. At full steam, a Big Boy engine would consume the tender’s coal and water supply in two hours, but a proper facility could replenish the coal and water in eight minutes. A large, mechanical stoker auger transported coal from the supply in the tender to the engine’s firebox; no regular fireman could keep up with the Big Boy’s prodigious need for fuel. The firebox was 235 in (5.97 m) long and 96 in (2.44 m) wide and burned coal at around 2,000 °F (1,093 °C). Heat from the firebox flowed through the boiler via a series of tubes, each 22 ft (6.7 m) long. The -1 class engine had 259 tubes: 75 2.25 in (57.2 mm) tubes and 184 4.0 in (101.6 mm) flues. With its altered boiler, the -2 class engine had 285 tubes: 212 2.25 in (57.2 mm) tubes and 73 5.5 in (139.7 mm) flues. If laid end-to-end, the tubes and flues would stretch 5,698 feet (1,737 m) for the -1 class and 6,270 feet (1,911 m) for the -2 class. After passing through the tubes, the soot, embers, smoke, and heat from the burning coal flowed into a smokebox at the front of the engine and then out into the atmosphere via dual stacks. The hot tubes, flues, and firebox provided the surface area to turn water in the boiler to steam. The -1 class had 5,889 sq ft (547.1 sq m) of evaporative surface area, and the -2 class had 5,755 sq ft (534.6 sq m). The water in the boiler was heated until 300 psi (20.7 bar) of steam had been generated. With a temperature of over 420 °F (215 °C), the wet, saturated steam was collected in a steam dome positioned above the boiler. The steam flowed from the dome to the saturated steam chamber in the superheater. Small superheater elements (tubes) took the wet steam back into the flues where it was heated well above its saturation value and converted to dry, superheated steam. The superheater elements delivered the dry steam to the superheated steam chamber in the superheater. Combined, the superheater elements stretched for over a mile (1.6 km). The -1 class had a Type E superheater with a surface area of 2,466 sq ft (299.1 sq m). The -2 class had a Type A superheater with a surface area of 2,043 sq ft (189.8 sq m). The Type A required less maintenance than the Type E and provided more than enough steam for the engine, and this is why the older Type A superheater was used. From the superheater, steam was piped to the Big Boy’s two sets of two cylinders. The Walschaerts valve gear controlled the flow of steam in and out of the cylinders. A piston valve mounted in a valve chest above each cylinder slid back and forth to allow steam to enter one side of the double-acting cylinder while simultaneously opening the other side to the atmosphere for the previous steam charge to escape. The steam flowed into the front of the cylinder and filled its 14,176 cu in (232 L) volume, pushing the 23.75 in (603.3 mm) diameter piston back 32 in (812.8 mm) to the rear end of the cylinder. The valve then slid rearward to open the front part of the cylinder to the atmosphere and direct steam into the rear part of the cylinder. The second blast of steam pushed the piston back to its original position. Although the cylinder was uniform in size, the cylinder’s return volume was only 13,345 cu in (219 L) on account of the 5.75 in (146 mm) diameter, hollow piston rod taking up some room. The piston rod was attached to the connecting rod via a crosshead. The connecting rod extended back to the third driving wheel in the four-wheel set. Here, the connecting rod was attached to the coupling rod, which was connected to all four driving wheels. To aid traction, sand could be deposited on the rails in front of each drive wheel. The Big Boy had two sandboxes mounted on top of the boiler and each held 4,000 lb (1,814 kg) of sand. The Big Boy was designed for a top speed of 80 mph (129 km/h), but its highest speed reported was a test at 72 mph (116 km/h). It is unlikely the engine was ever operated in service much beyond 50 mph (80 km/h). Of course, hauling the heaviest loads up the steepest grades reduced the engine’s speed to around 12 mph (19 km/h), the speed at which its tractive effort was at a maximum of some 135,375 lbf (602.2 kN). The 80 mph (129 km/h) speed design ensured that parts were built to withstand stresses well beyond what was needed to haul freight at 40 mph (64 km/h). At 41 mph (66 km/h), the Big Boy produced some 6,290 hp (4,690 kW) at the drawbar, which would be around 7,157 hp (5,337 kW) produced at the cylinders. Without any slip, each rotation of the drive wheels moved the engine 17.8 ft (5.4 m). At 41 mph (66 km/h), each drive wheel rotated 202 times a minute, and each double-acting piston made 404 strokes. This resulted in roughly 12,869 cu ft (364.4 cu m) of steam passing through the Big Boy’s cylinders every minute. Four seats were provided in the Big Boy’s cab, although the engine only required a crew of three: an Engineer, a Fireman, and a Brakeman. If needed, the cab could accommodate six occupants with two additional makeshift seats. Each of the 20 -1 class engines cost $265,174 in 1941, and each of the five -2 class engines cost $319,600 in 1944. The equivalent cost for each engine would be over $4,335,000 in 2016. All Big Boy locomotives were pressed into service as soon as they could be delivered. Originally cleared to pull 3,200 tons (2,903 t) up the 1.14% grade between Ogden and Green River, the engines were eventually allowed to haul 4,450 tons (4,037 t) as experience was gained. On a .82% grade, the engines were cleared to haul 5,360 tons (4,863 t). Theoretically, the Big Boy could pull a train 5.5 miles (8.9 km) long on flat ground from a standing start. In practice, the engine routinely pulled over 100 cars. 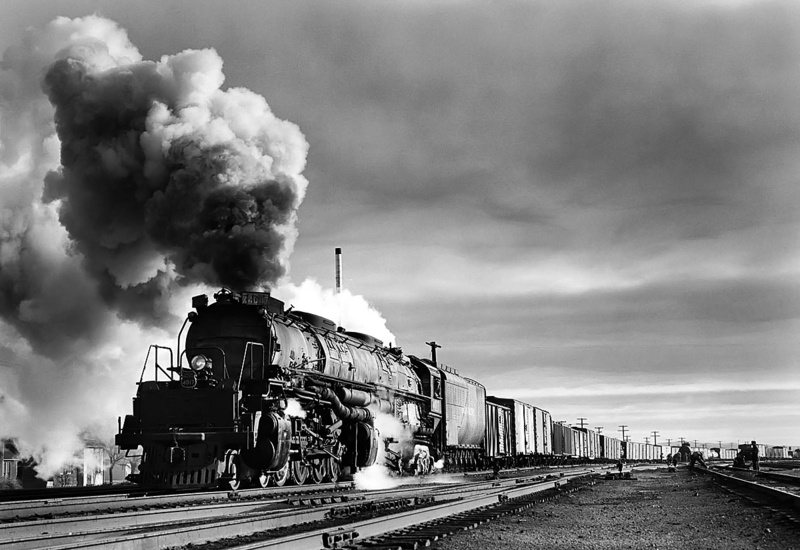 During World War II, the Big Boys spent most of their time moving freight between Ogden and Green River. On a typical run from Oden to Evanston, Wyoming, with a stop in Echo, Utah, a Big Boy would take about four hours to cover the 76-mile (122-km), uphill route and climb some 2,500 ft (762 m). Engine 4016 made the trip in 3 hours and 50 minutes while hauling 71 cars, for a weight of 3,883 tons (3,523 t). The Big Boy consumed 74,700 lb (33,883 kg) of coal and 34,800 gallons (131,732 L) of water. This averages to 19,487 lb (8,839 kg) of coal and 9,078 gallons (34,364 L) of water used per hour, or 996 lb of coal and 464 gallons of water per mile (280 kg and 1,089 L per km). Under full steam, the Big Boy was said to consume 22,000 lb (9,979 kg) of coal and 12,000 gallons (45,425 L) of water per hour. After World War II, Big Boys were occasionally used for trips to southern Utah and did make regular trips into Wyoming, going as far as Cheyenne, 483 miles (777 km) from Ogden. The Cheyenne trips required conquering the 1.55% grade up Sherman Hill and passing through the Hermosa Tunnel at around 8,000 ft (2,438 m). In the 1950s, their service expanded on occasion as far east as North Platte, Nebraska and as far south as Denver, Colorado. Although the engines were cleared for other routes, like Ogden to Los Angles, they never made the journey in regular service. The ever-increasing tonnage needing to move on the rails resulted in even the Big Boys using helper engines to speed up travel over the steep mountain passes. Rarely, two Big Boy engines would be linked to doublehead a train quickly over the mountain. The Big Boy engines proved very reliable in service, but they did require a significant amount of maintenance. 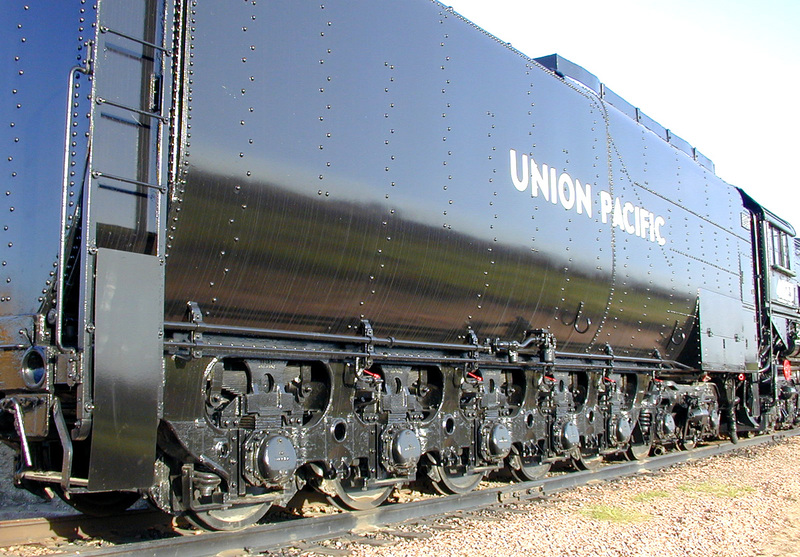 UP considered purchasing additional engines, and other railroads thought about buying Big Boys, but resources were somewhat limited during World War II. After the war, diesel locomotives were proving themselves as the prime mover of the future. Still, Big Boys soldiered on and were one of the last steam locomotives in regular service. The last Big Boy was removed from revenue service on 2 July 1959. The engines were kept in storage until August 1961, when the first were retired. The last Big Boy was retired in July 1962. At the time of their retirement, each of the -1 class Big Boys had accumulated over 1,000,000 miles (1,610,000 km)—the equivalent of traveling from the Earth to the Moon and back twice. Engine 4006 had the most miles, at 1,064,625 (1,713,348 km). Each of the -2 class engines had traveled over 800,000 miles (1,290,000 km)—the equivalent of circling the Earth 32 times. At 855,163 miles (1,376,252 km), engine 4021 had the highest mileage of the -2 class. All total, the Big Boys accumulated 25,008,054 miles (40,246,574 km); this is about the distance from Earth to Venus when the planets are at their closest point. Although the Big Boy was very impressive, there were other locomotives that were larger, heavier, and more powerful, but probably none that were all three. What makes the Big Boy unique is that even with its massive size and colossal power, it was in regular service for nearly 20 years—it was not an experimental train, and it was not limited to a small section of track. The Big Boy was also not a Mallet-type locomotive. Although it was articulated, the Big Boy was not a compound steam engine, which is the second hallmark of a true Mallet. Seventeen of the Big Boy engines were scrapped, while the remaining eight were put on display in various museums. As of 2016, seven of the Big Boys are still on display. 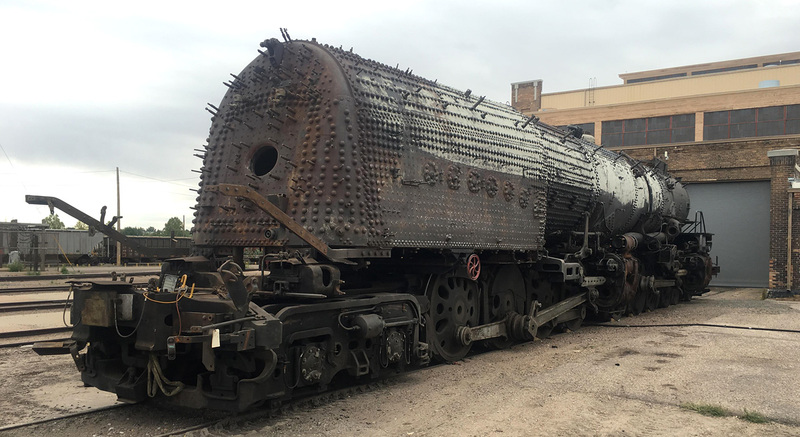 The remaining engine, 4014, was reacquired by UP in 2013 and is undergoing restoration to working order at their facility in Cheyenne, Wyoming. The restoration is planned to be completed by 2019, in time for UP’s 150th anniversary. However, the amount of work needed to return 4014 to working order is substantial. 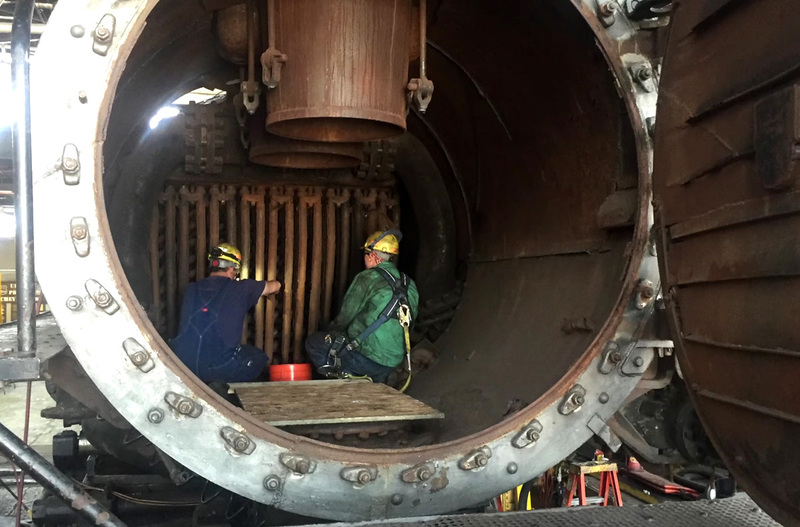 Part of the restoration includes converting the engine from coal fired to oil fired. Regardless, Big Boy 4014 will once again take to the rails, but only for special excursion service; its days as a workhorse ended some 50 years ago. This entry was posted in Rail on 20 December 2016 by William Pearce. The fireman was probably hoping on every trip that the mechanical stoker didn’t break down, and then he had to pick up the shovel to fed the engine’s voracious appetite! Before the article was published, I had written that a mechanical stoker was used as no fireman could keep up with the Big Boy’s prodigious need for fuel. But then I read that a fireman named Dillard Hill shoveled 27 tons of coal into a Big Boy’s firebox when the mechanical stoker broke. The boiler pressure dropped, but they kept the engine going. I then changed it to no “regular” fireman being able to keep up. The machines and the men who operated them were something else! Nice article! There is , however, a typo. Where it says, “the cylinder’s return volume was only 13,345 cu in (279 L)…”, the figure should actually be 219L. Right you are Andy; great catch! What magnificent machines! Another great article. Wouldn’t it be fun to ride one of them as they thundered out of Ogden. Thank you Frank. Yes, seeing the restored Big Boy under steam is on my bucket list. It my not be out of Ogden, but it will work. It may be noteworthy that Big Boy #4004 is to undergo a cosmetic restoration ( that may already be in progress) as it resides in Holiday Park in Cheyenne, Wyoming. Thank you for posting an excellent and very interesting, informative article. Hello Ernie – Thank you for the information, and I’m glad you liked the article. It’s more than a cosmetic restoration. 4004 is being entirely rebuilt. Why was/is the front end of the smokebox on the Big Boy class grey or silver ? The smokebox got so hot that the standard paint would get damaged and deteriorate. The smokebox was treated with a mixture of oil and graphite that resulted in the gray color. This was common with a number of other locomotives. Your reply appreciated. Living in the UK I have visited all the preserved 4000 class through the USA in their different locations. At those in Museum locations not one person was able to tell me the answer. Looking forward to a visit in May to see 4014. Best wishes and I hope the weather is not too bad where you live. man I wish I could own and drive one of Big Boys.